I once dated this guy that was such a nutty hippie, that he would clean his house using the leftover liquid pressed out of his homemade tofu. This is what comes to mind when I think about “natural cleaning products”. That, and of course the smell of greasy dreadlocks and rotting soy juice. Thanks for the memories. I’ve moved on since then, to more hygienic boyfriends and to embracing the idea that you can make environmentally friendly cleaning products that are actually effective. Health food stores are loaded with all kinds of fancy and over-priced concoctions of baking soda and vinegar, so put your wallet away and take a trip to your kitchen cupboard. I guarantee you’ve got the goods to begin your very own cleaning arsenal. Commercial cleaning products are bad for the environment, but more importantly our health. And since we have no control over the sickotating toxic fumes we are inhaling outside, wouldn’t it be nice to know that air inside our homes is at least somewhat safe? Non-toxic cleaning can give you a deep feeling of gratification in knowing that your family’s health is protected, and that your home is a place for your bodies to rest and recuperate rather than promote harm. In the photo above you will see everything you need to begin your super-natural cleaning adventure. From left to right: clean jars; lemon; bottle of essential oil of tea tree; baking soda; non-toxic biodegradable liquid soap; white vinegar; recycled, empty spray bottle. 1. Lemon – one of the strongest food-acids, effective against most household bacteria. 2. Tea Tree Oil – nature’s most powerful anti-bacterial agent. Great for use in the bathroom and kitchen. 3. Baking Soda – cleans, deodorizes, softens water, scours. 4. Soap – unscented soap in liquid form, flakes, powders or bars is biodegradable and will clean just about anything. Sometimes this is called “Universal Cleaner” (pictured) and you can purchase this at health food store. Avoid using soaps, which contain sodium lauryl sulfate, phosphates and petroleum distillates. 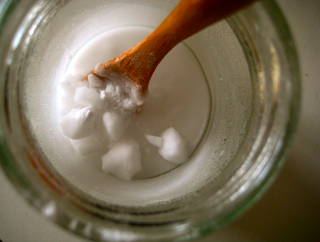 All-Purpose Cleaner: Mix 1/2 cup vinegar and 1/4 cup baking soda (or 2 teaspoons borax) into 2 liters water. Store and keep. Use for removal of water deposit stains on shower stall panels, bathroom chrome fixtures, windows, bathroom mirrors, etc. All-Purpose Disinfectant: Mix 2 cups water, a few drops of natural soap, and 15 drops each of tea tree and lavender organic essential oil. You can spray this on all kinds of home surfaces – changing tables, cutting boards, toilets, sinks, walls, and more. Just don’t use this on glass, as it will streak. Carpet Stains: Mix equal parts white vinegar and water in a spray bottle. Spray directly on stain, let sit for several minutes, and clean with a brush or sponge using warm soapy water. 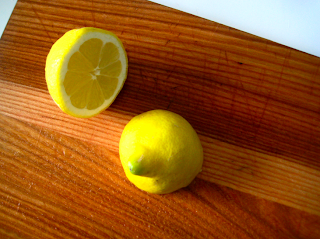 Chopping Block Cleaner: Rub a slice of lemon across a chopping block to disinfect the surface. For tougher stains, squeeze some of the lemon juice onto the spot and let sit for 10 minutes, then wipe. Coffee and Tea Stains: Stains in cups can be removed by applying vinegar to a sponge and wiping. To clean a teakettle or coffee maker, add 2 cups water and ¼ cup vinegar; bring to a boil. Let cool, wipe with a clean cloth and rinse thoroughly with water. Drain Cleaner: For light drain cleaning, mix ½ cup salt in 4 liters water, heat (but not to a boil) and pour down the drain. For stronger cleaning, pour about ½ cup baking soda down the drain, then ½ cup vinegar. The resulting chemical reaction can break fatty acids down into soap and glycerin, allowing the clog to wash down the drain. After 15 minutes, pour in boiling water to clear residue. Caution: only use this method with metal plumbing. Plastic pipes can melt if excess boiling water is used. Also, do not use this method after trying a commercial drain opener–the vinegar can react with the drain opener to create dangerous fumes. Lime Deposits: You can reduce lime deposits in your teakettle by putting in ½ cup white vinegar and 2 cups water, and gently boiling for a few minutes. Rinse well with fresh water while kettle is still warm. Marks on Walls and Painted Surfaces: Many ink spots, pencil, crayon or marker spots can be cleaned from painted surfaces using baking soda applied to a damp sponge. Rub gently, then wipe and rinse. Mold and Mildew: Mold is extremely harmful to human lungs. Prevention is the key! To prevent mold from ever occurring, mix two cups of water and three drops of pure organic tea tree essential oil. 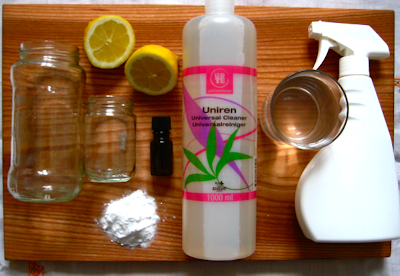 Once a week, spray your walls with this solution (even behind furniture) and wipe dry. This mixture fights stains and the natural antiseptic qualities of tea tree oil fights mold and mildew. To get rid of mold, use white vinegar or lemon juice full strength. Apply with a sponge or scrubby. Oil and Grease Spots: For small spills on the garage floor, add baking soda and scrub with wet brush. Oven Cleaner: Moisten oven surfaces with sponge and water. Use ¾ cup baking soda, ¼ cup salt and ¼ cup water to make a thick paste, and spread throughout oven interior. (Avoid bare metal and any openings) Let sit overnight. Remove with spatula and wipe clean. Rub gently with fine steel wool for tough spots. Pots and Pans: For burned and crusted-on foods, soak or boil a solution of 2 Tbsp baking soda per qt of water in each pan. Let stand until particles are loosened, then wash as usual. Use a mild or moderate abrasive if necessary. Rust Remover: Sprinkle a little salt on the rust, squeeze a lime over the salt until it is well soaked. Leave the mixture on for 2 – 3 hours. Use leftover rind to scrub residue. Scouring Powder: For top of stove, refrigerator and other such surfaces that should not be scratched, use baking soda. Apply baking soda directly with a damp sponge. Stickers on Walls: To remove, sponge vinegar over them several times, and wait 15 minutes, then rub off the stickers. This also works for price tags (stickers) on tools, etc. Toilet Bowl Cleaner: Mix ¼ cup baking soda and 1 cup vinegar, pour into basin and let it set for a few minutes. Scrub with brush and rinse. A mixture of borax (2 parts) and lemon juice (one part) will also work. Window Cleaner: Mix 2 teaspoons of white vinegar with 1 liter warm water. Use crumpled newspaper or cotton cloth to clean. Don’t clean windows if the sun is on them, or if they are warm, or streaks will show on drying. The All-Purpose Cleaner (above) also works well on windows. Be sure to follow the recipe, because using too strong a solution of vinegar will etch the glass and eventually cloud it. So, that should be enough to get you started! Isn’t it incredible just how much you can clean with a few basic kitchen items? We’ve all fallen prey to the terrifying television commercials, scaring us into buying caustic and toxic potions. No more! Now you armed with the knowledge to go clean your home your way, with your health in mind. Birkenstocks optional. and I used to go to see this web site all the time. Hi, one question: I know that honey is an antibacterial agent, so would it be possible to use that instead of tea tree oil? Thanks! love the first paragraph! haha.